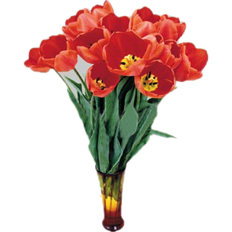 Send Bouquet of Red Tulips to , Ukraine | $35 | Best florists and Courier delivery service. The breath of Spring is beautiful fresh red tulips that are sure to brighten anyone's day! A few stems of tulips will become a great gift on the Women's Day (8th of March) or for a birthday, for any young girl or women of all ages. Order tulips to Ukraine with us. Sending tulips to Ukraine is an easy. 10 minutes and your order is done, withinn 24 hours the red tulips are delivered in , Ukraine. Our courier delivery service has been at your service since 1999. The best florists and online help are available 24/7. Looking for more spring bouquets? See our catalog of spring bouquets and choose the one you need! Order flowers delivery and leave your Feedback here, please.